It’s never been easier to whip up a romantic dinner! Put a few tealights on the table, pour a glass of wine (ahem, for the antioxidants, of course! ), and fire up the stovetop grill or the one on your patio. Set the grill to medium or medium-high heat. Defrost 3 ounces of shrimp per person. Just eyeball it; each serving should be about the size of a deck of cards. We like to take frozen shrimp and put them in a cold-water bath for a few minutes until the ice is melted. Peel away the shells, pat the shrimp dry and put them in a dry bowl with olive oil, salt, lemon juice, and other seasonings, if desired. Let that sit in the fridge for a few minutes while you prepare the veggies. Season sliced red onion and asparagus with a drizzle of oil and regular salt, or get good and fancy by seasoning it with Hawaiian salt (which we introduced you to in this post). Grill the onion to desired softness and then add asparagus. Grill the asparagus for several minutes, turning them once grill marks can be seen, and they turn bright green. Remove the onion and asparagus from the grill. Add the raw shrimp and grill on one side until pink. Turn over and cook on the opposite side until the shrimp are just opaque, but don’t overcook. 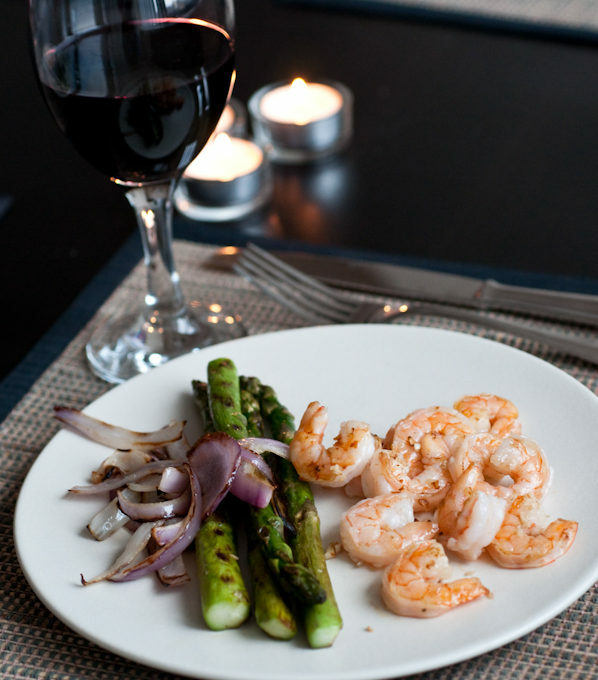 Cook one sample shrimp first to test out cooking time on your grill. Now that asparagus is coming into season, it is a great addition to a grill menu. In fact, with few exceptions, grilled is the only way Sam will eat asparagus, healthy as it may be. An excellent source of Vitamin K, asparagus also offers folate, fiber, Vitamin C, and potassium. You may notice purple and white asparagus at the farmer’s markets and grocery stores from now through the summer. You’ll be hearing more from us on the topic of seafood, as we love spreading its good health message. 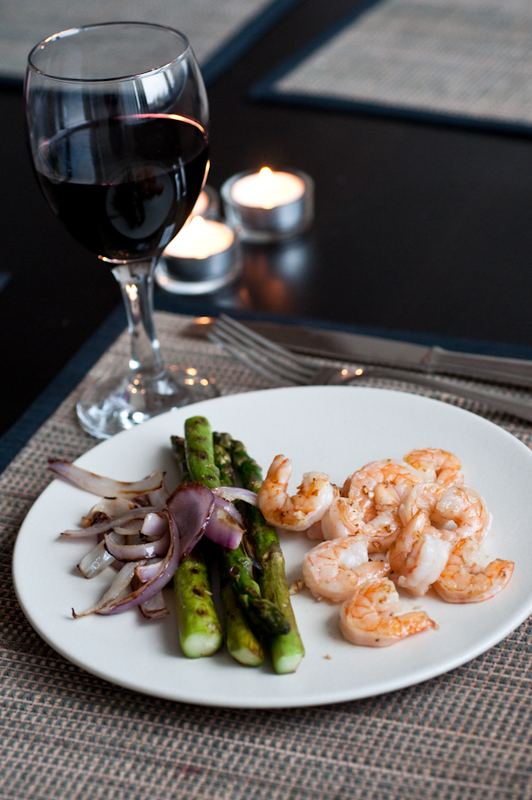 We’ll be repeating this message: shrimp is low fat, high protein and easy to cook. How Stacey Got the Shot: On the fly, so that dinner wouldn’t get cold! ISO 640, 60mm focal length, f/4.5, 1/60 second exposure.